I headed off to college at the end of the summer of '74. Let's pause briefly at those two words: "headed off." Those words typically precede lines like: "headed off in the wrong direction,"...headed off to war," and "...headed off to the army." But when I say "headed off to college" I don't mean to imply independence or courage as much as distance. Never in my eighteen years had I been further from home--695 miles to be exact--than the day my parents dropped me off in front a large, three-story dorm at the end of a street lined with four such buildings The sidewalks were bustling with suitcases, trunks, and duffle bags going in all directions. Some kids can't wait to leave home after high school. This was not true of my four siblings and me. We were all pretty much "home bodies," and in many ways we still are. My first night in the dorm room, the day my folks left (the day before my roommates arrived) I stared at the bottom of the empty bunk above mine well into the night. It was just about the saddest time of my life. By morning, I felt slightly better and took comfort in the company of many high school friends who also attended the same university. Among them was my older brother Dave, who was a junior, two years ahead of me. It was a blessing to have an upperclassman sibling who knew the ropes in a setting that sometimes felt like a military academy. Dave knew the DOs and DON'Ts--the hard professors, the best bunks, and a hundred other things a freshman typically learns the hard way. The biggest perk of having an older brother on campus, however, was that fact that he had hundreds of friends who treated me like their own kid brother whenever we passed. I didn't think about it at the time, but feeling "known" in an otherwise strange place helped shape my entire college experience. My sophomore year provided another bonus, my sister Kathy (who became a teacher in 1974 and had married in '75) accepted a teaching position on campus. Kathy and her husband Jack made the 700-mile trip themselves and moved into a quaint upstairs apartment in town. Dave and I often spent Friday nights there. It was not quite home, but it was a nice change of pace from dorm life. More about this in a moment. So yesterday, I'm working in my office and one of our maintenance men surprises me with a box of books he found in a far-corner closet of our building. It's a small closet that rarely gets unlocked. Evidently I put some of my college books in there several years ago (though I honestly do not remember doing so). Back in the day, college students were told: "Keep your text books. You'll use them." Well, I kept 'em, but I really can't say that the advice applies equally to all books. Oh, I have some of them on my shelves for ready reference, but the ones in this box did not make that cut. They have literally not seen the light of day for decades, and had I never seen them again, I would never have remembered they still existed, and yet, I could not resist thumbing through them to see if I should keep or pitch them. The full box is still in my office. I got sidetracked by what became the subject of this post. 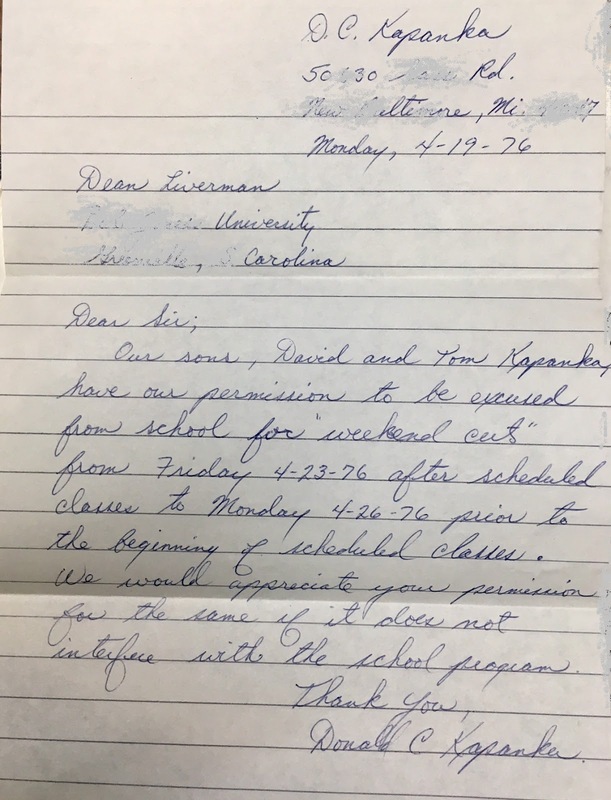 I had not seen the letter for 41 years, and looking at it simply as an artifact, I was surprised by my father's nice penmanship. My handwriting has never been good, and it seems to be worse with age. I did not remember this about my father. As soon as I saw the dates, the purpose of its writing came back to me. Dad wrote it on Monday, April 19. This is well before email and possibly before fax machines. So Dad probably talked to Kathy on the phone Sunday. (We always made long-distance calls on the weekend when rates were low.) She probably shared her idea, and he wrote the note the next day to drop in the morning mail. Well, as I recall, my brother-in-law Jack worked at a car dealership while going to grad school, and he had just bought one of the coolest cars of the late 1970's: an AMC Pacer. Jack was eager to take a road trip, and Kathy, Dave and I had never seen the ocean. (We had grown up surrounded by the Great Lakes, the largest bodies of fresh water in the world, but we'd never seen the Atlantic.) So with the help of Dad's letter--yes parental permission was required for such things at this university--Dave and I got authorization for "cuts" (but you'll notice we were not actually going to "cut" any classes, a minor detail), and by Friday afternoon we began the 250 mile trek to Myrtle Beach, S.C. (This was before that venue was so developed.) Kathy got a good deal at a slightly run-down beach-side motel called the Tiki Inn. It was not run-down to us at the time, because at the time Dave and I had only stayed in a motel a couple times in our lives, and none of them were as nice as this one. In looking back, however, it was a small, comfortable place whose thematic décor was true to its name. Its single greatest feature was the short walk to the breaking waves. The next 48 hours were a holiday like no other. The temperature was warm, and compared to the Great Lakes, the ocean was like bathwater even in April. Dave and I were almost always broke back then, and I'm sure Jack and Kathy had little money to spare--what with the new car payments and all--but we felt like we were rich that weekend being far from books and bells and the bothersome routines of campus life. It is a trip that the four of us have talked about through the years, but never have the details come flooding back so vividly as when I read Dad's letter yesterday. I've seen the ocean now, and tasted its salt. I've felt its fine sand between my toes. the cry of the gulls, and the wind across the sand. their back's against the city's light.